Coming from a working class background Sir William Arrol was interested in the welfare of the working classes and supported policies to encourage trade, reduce taxation and encourage free education. He had been a supporter of the Liberal Party most of his life but by the time he entered a political career he had become a member of the Liberal Unionists. The Liberal Unionist Party was formed in 1886 by a faction of the Liberal Party who did not support William Gladstone’s bill for Irish Home Rule. They were concerned that introducing limited self-government in Ireland would eventually lead to independence for Ireland and the break-up of the United Kingdom. Although his politics were very much aligned with Liberal Party policies, on this one point Sir William Arrol felt very strongly that both Ireland and Scotland needed to remain united with England for economic survival. 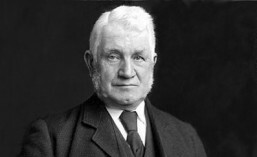 He first first stood as the Unionist Party candidate for South Ayrshire in the 1892 General Election, but was defeated. Gladstone’s Liberal Party came to power that year but the Liberal Unionists sided with the Conservative Party creating an overwhelming majority which defeated Gladstone’s Home Rule bill. In the following General Elections in 1895 and 1900, Sir William Arrol was successfully voted in as M.P. for South Ayrshire and the Liberal Unionists formed a coalition government with the Conservatives. In his 10 years as Member of Parliament for South Ayrshire (1895 – 1905) Sir William Arrol was not the type of self-seeking politician giving long-winded speeches in the debating chamber. Neither was he a silent member and when he did address the House, the members would listen to him respecting him as a man and also the strong, reasoned arguments he put across. According to his friend and biographer, Sir Robert Purvis, Sir William Arrol’s strengths as a politician were behind the scenes in the numerous committees on which he sat, such as those for the Tube Railways; London Water Board; London Corporation; and the Cooper’s Hill Engineering College Enquiry. Following a spell of poor health Sir William retired from politics in 1906.